Our pre-packaged, ready-made, downloadable album collections of stock music and royalty free music (and also sound-effects) are typically priced at around $99 – $139 per collection, but by buying a lot of them together in a single purchase, you can get them for very heavily discounted prices, even down to $50 each. For example, you can get any 5 collections (*Excluding collections priced at $150 or more) for $439, or any 20 collections for $1299. Download + simple / generic DVD-ROM’s sent to you by postal service: +$3 per collection. Download + nicely made DVD’s with full color artwork and DVD-cover: +$6 per collection. 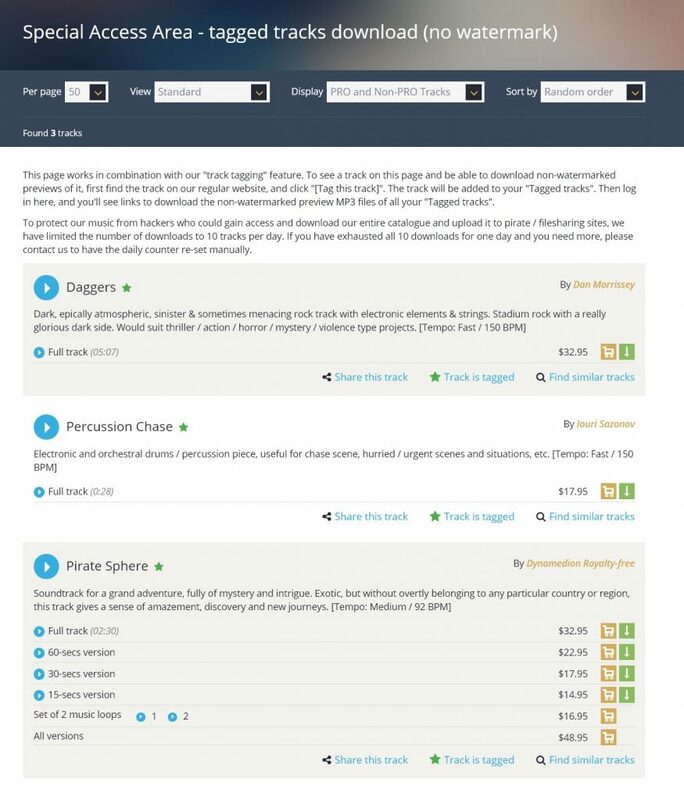 The “downside” is that these collections are ready-made and packaged together, so the tracks contained in each collection is already pre-selected and you cannot hand pick individual tracks to create your own collections. They are what they are. So, each collection may contain some tracks that you don’t ever end up using, but on the other hand, you are saving a lot of money by buying them together — even if you don’t actually end up using every track. 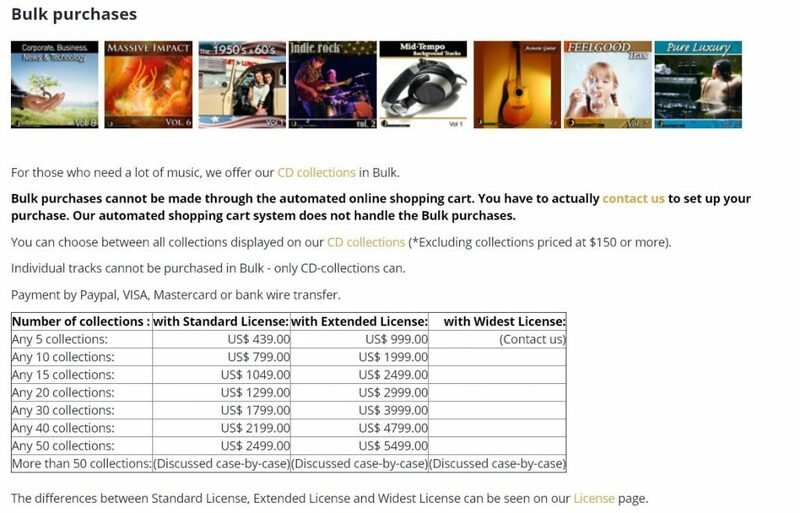 Discounted bulk CD-collection orders cannot be made using the online shopping cart system. The shopping cart does not apply the discount. In order to buy such a Bulk offer, you have to contact us and communicate with us in person. When you download or listen to preview music files at Shockwave-Sound, the sound quality is reasonable, but there is a “preview…. shockwave-sound dot com….” voice mixed into the music at a discrete level. However, access to download non-watermarked MP3 preview files may be granted to clients with specific needs to download our music to try it out in their project, without the voiceover watermark, before buying a license. Other companies that we feel it is in our particular interest to show this level of trust. If you would like to speak with us about getting access to our non-watermarked MP3 preview files, please contact us through our contact form. Please include your full name, company name, company postal address, company website, telephone number, and a short introduction of your company and how you plan to use our files. Most likely we will give you a phone call to discuss briefly, and then set up your access. Hi all, here is a quick recap of the 9 new ready-made collections – downloadable CD of royalty-free music / stock music that we have released over the past two months approximately. There are a lot of different styles of music here, something for just about all types of media productions. 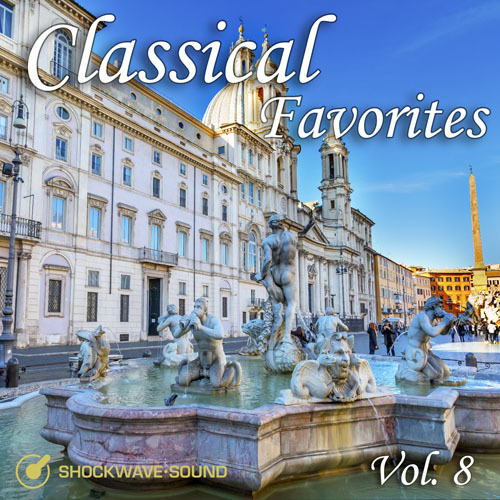 https://www.shockwave-sound.com/royalty-free-music-collection/790/music-collection-classical-favorites-vol-8 16 timeless classical works by Mozart, Bach, Dvorak, Vivaldi, Schubert and Holst, in lavish, meticulous recordings. 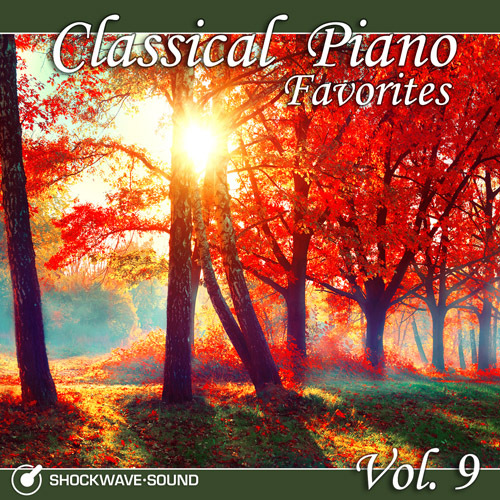 https://www.shockwave-sound.com/royalty-free-music-collection/791/classical-piano-favorites-vol-9 Elegant, timeless, classical piano works, performed live in studio and recorded in 24-bit pristine perfection. Chopin, Beethoven, Bach, Brahms, Burgmuller and traditional works. 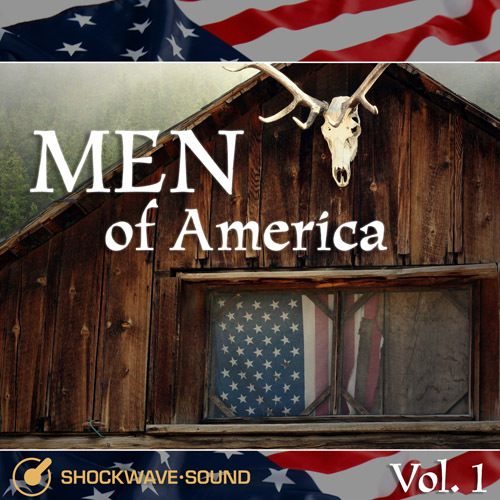 https://www.shockwave-sound.com/stock-music-collection/792/men-of-america-vol-1 Folk, Americana and Country oriented music with a sound and feel of the American back-country. Swampy, sweaty, and earthy. https://www.shockwave-sound.com/royalty-free-music-collection/793/happy-days-vol-10 – Bright and “sunshiny” tracks with a joyful, jovial and fun vibe. Great music for commercials, YouTube videos, how-to videos, presentations of various “fun and bubbly” type content. 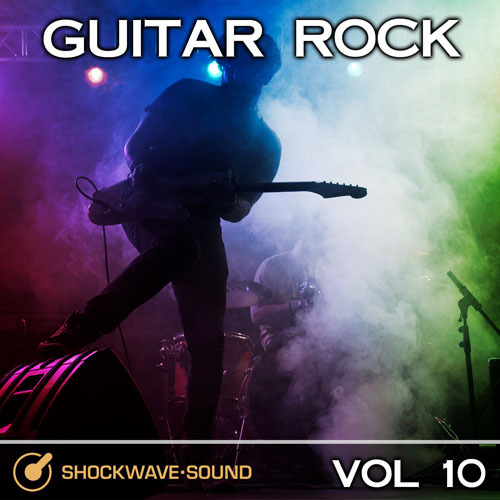 https://www.shockwave-sound.com/stock-music-collection/794/guitar-rock-vol-10 – Varied, dynamic, fresh and gutsy, positive and vibrant guitar rock music. 11 tracks that will fit well with sports, advertising, active lifestyle and male oriented content. 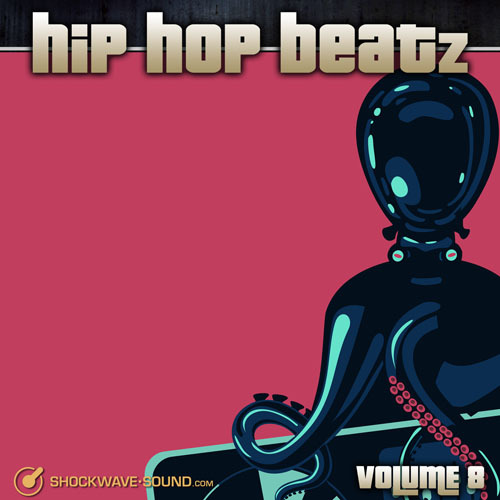 https://www.shockwave-sound.com/stock-music-collection/795/hip-hop-beatz-vol-8 – Hip Hop / Funk / Urban crossover type music with an emphasis on youth culture, urban culture and edgy urban content. 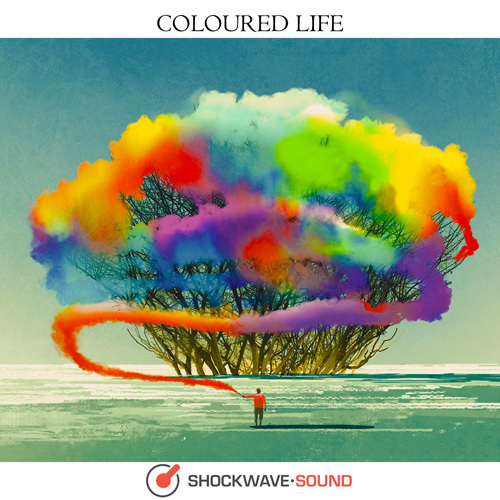 https://www.shockwave-sound.com/stock-music-collection/796/coloured-life – A beautiful collection of “light orchestral” type music which goes well with drama, TV, stories, and as background music for many types of media. Neo-classical, contemporary, transparent. Just wonderful music. 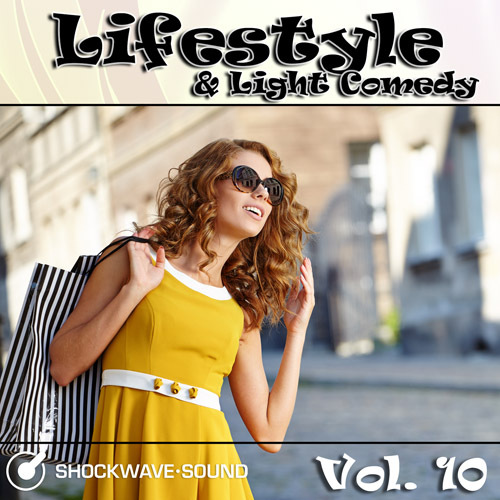 https://www.shockwave-sound.com/stock-music-collection/797/lifestyle-light-comedy-vol-10 – Quirky, tongue-in cheek and lively. Family friendly, bright and fun — these tracks will go well with daytime TV, commercials, YouTube / Online presentations about the fun and brighter side of life. 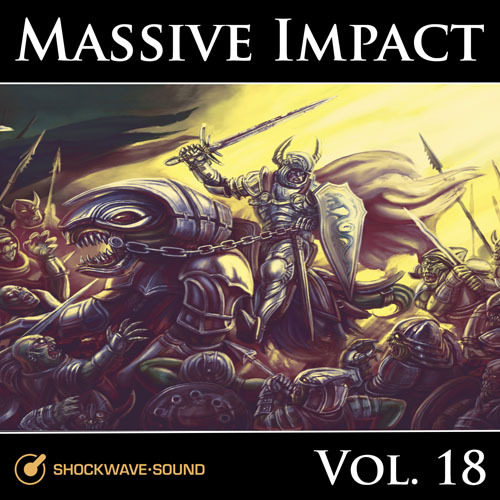 https://www.shockwave-sound.com/stock-music-collection/798/massive-impact-vol-18 – 11 tracks of epic power. Fantasy wars, heroes and knights, battles and epic struggles. Overcoming and triumphing. This music is great for fantasy, sports and epic footage of all kinds.